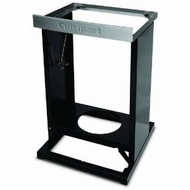 Elevate your grilling with Cuisinart's folding grill stand. Great for use full-time on your patio or deck or for taking to the big game or the beach. Keeps your Cuisinart grill at the perfect height for cooking. Rugged and sturdy all-metal construction. Folds flat quickly and easily for transport. The stand has tool hooks, and a mid-level shelf that has a hole to securely hold a 20 lb. LP tank.